This week warmed up considerably (almost 50 degrees! ), which meant that I quickly ditched my wool coat in favor of a lightweight trench + a few layers to keep toasty for a day of running errands around town. While I know that the snow will return at some point, I’m enjoying this shift of temperatures for now and taking full advantage…which means you’ll be seeing some “lighter” outfits from me as long as the weather allows. *As a side note, if you don’t already own one, now is a great time to buy a classic trench because most of them are on sale. 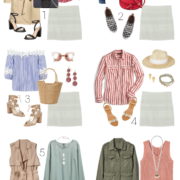 I’ve included links below for 3 options, including one London Fog style that’s under $75 (a great price for that brand)! 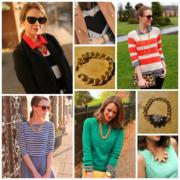 you are the layering queen! i love these booties girl! i never thought i would love mine as much as i do. i wish i had them in more colors!!! Great layer look! I love the neutral colors play so well together in this outfit and the pop of color from your purse. I agree, a classic trench is always in style and a great investment. You look stunning! Cute look! And this post totally reminded me that I have brand new Zara trench sitting my closet (tags still attached). Fabulous jeans and scarf, looking gorgeous! I just love the jacket!!! You have the best fashion blog ever! Keep on posting beyond cute outfits!!!!! Great Trench, I added studs to the sleeves of mine after seeing a Burberry one I can't afford… I think I'm going to take your advice tho and get another that's just plain! and btw, fabulous color on the bag! LOVE this casual look Kimberly! the booties are fabulous! Kimberly, you look beautiful in this trench coat. If you get a sec, check out my latest post… Pops of Color. What a fantastic combination of a classy style with jeans! You look gorgeous and I especially like your Wayfarers and jewellery for the extra touch. We're about to get a weather warm-up here in Indiana over the weekend, and I can't wait to pull out my trench coat now (thanks to your inspiration!). I got it on sale a F21 for $7 (half-off the clearance price—score!). I love the Old Navy vest. I almost bought it but then hesitated and now I'm really regretting it! 🙂 The boots are great too! I have been obsessed with layering my old navy vest under jackets. Well blazers and cardigans, mostly. I think it is the best way! I never really thought I would wear mine as much as I have been! Love your look! I am definitely in the market for a new trench! Thanks for including! Also, today I am wearing a sweater under a blazer, totally inspired by you! im happy to have come across your blog. Layers! Yes! I neeeeeed a trench coat! i need that scarf, vest, jacket, well actually all of it! love this outfit lady!! Beautiful, casual look. I love the double collars along with the scarf. You totally nail casual chic! Love your casual look and all of your layers! You always look so pretty and put together!! Love this! The classic trench is a great piece to have – I feel so lucky I thrifted a london fog for only $3! Can't wait for a break in these freezing temps so I can take it out! Stunning, classic, and I'd love to look like this! My blog has lots of beauty recipes, like the ones Megan had on her blog today, so please visit sometime. Hope your day is stellar. The trench is great, and I love the color of your bag! We just found your blog and wow, its amazing! You have beautiful photography and we were looking through your recent posts, you have awesome style. Love, love the subtle pops of colour and effortless layering here. You look stunning (and your photos are gorgeous, too)! Also, completely jealous of your amazing skin and the way your face shape looks with Wayfarers. Beautiful! Love how you layered! That trench is perfect for this time of year. Loving that the weather is more balmy than usual! Love the classic trench….always timeless!!! What a beautiful, simple, classy outfit! I want all of it.